The Gaia mission has uncovered a major event in the formation of our Milky Way galaxy, now thought to be the result of a merger with a smaller galaxy called Gaia-Enceladus. “This discovery completely changes our perception of galactic structures as we thought we knew them”, according to Carine Babusiaux, a research scientist at the IPAG planetology and astrophysics institute/OSUG, the Grenoble universe sciences observatory, in charge of simulations for the Gaia mission and co-author of a paper announcing the discovery in the journal Nature. Five years into its mission, the Gaia satellite has reaped an unprecedented harvest of data. Its original goal was to survey the position and velocity in three dimensions of approximately 1% of the stars in our galaxy. Gaia has so far surveyed more than 1.7 billion stars and science teams are continually adding to the catalogue as data analysis advances. Ultimately, the 450 scientists and engineers working on this European mission aim to establish a 3D picture of the Milky Way and its movements. For that, the satellite has a suite of three instruments: an astrometer to measure the position of stellar objects; a spectrometer to measure their velocities along the line of sight; and a photometer to characterize their physical properties (temperature, gravity, metal content, etc.). 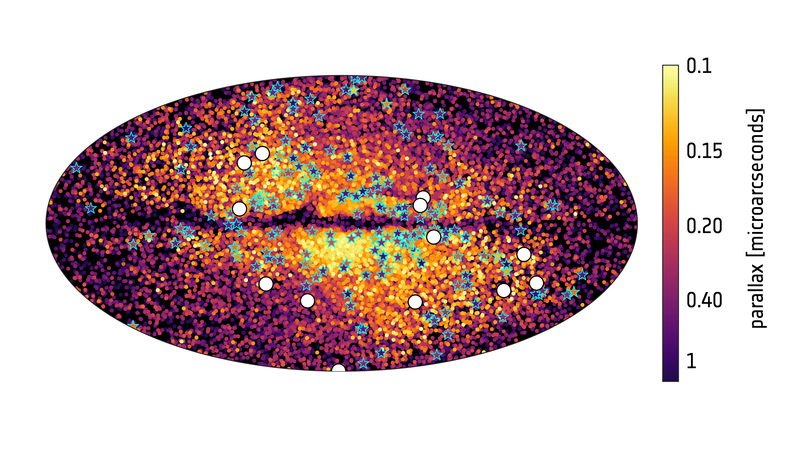 During Gaia’s survey, 30,000 stars in particular attracted scientists’ attention as a somewhat ‘odd’ collection. Carine Babusiaux explains: “Using the radial velocities of these stars calculated by CNES, the mission science team saw they were moving in the opposite direction to the hundreds of billions of stars making up our galaxy. What’s more, their orbit was a little more elliptical than the other stars. At the same time, other teams determined their colour and absolute magnitude, which also showed that the stars stood out on the Hertzsprung-Russell diagram that compares stars according to their temperature and brightness.” This collection was too distinct from the rest of the stellar population not to have originated outside our galaxy, but two more elements were needed to validate this hypothesis: the stars’ chemical composition—determined using the APOGEE spectrograph—confirmed that the interlopers weren’t in our galaxy when it was formed, while numerical simulations by a team led by Amina Helmi at the University of Groningen in The Netherlands showed that the merger of two galaxies could yield a result similar to that observed in this stellar collection (see video below). Simulation d'une collision entre une jeune galaxie comme la Voie lactée et une plus petite galaxie comme Gaia-Encelade © Koppelman, Villalobos and Helmi, Kapteyn Astronomical Institute, University of Groningen, The Netherlands. All the results pointed to the Milky Way having merged with a smaller galaxy in its early youth, some 10 billion years ago. The mass ratio between the two was nonetheless four to one, so our galaxy would have been completely reshaped by this accretion event. Subsequently, it swallowed up other galaxies, but with a much less voracious appetite. So this ancient merger remains a major event in the Milky Way’s history. Called Gaia-Enceladus after the Greek giant Enceladus, son of Gaia (the Earth) and Uranus (the Sky), this alien collection was completely consumed and its ancient stars today form most of the inner halo of the Milky Way. The stars already present in our galaxy at the time of the merger would also have been disturbed by this massive influx of exogenous stars. The accretion of Gaia-Enceladus is thought to have helped the thick disk of our galaxy to form. “Gaia’s data show us that outside disturbances have major effects on our galaxy,” says Carine Babusiaux. Another study based on Gaia data and published in Nature in September has reached the same conclusion, using the radial velocity calculations performed by CNES for six million stars to reveal populations rotating non-uniformly about the galactic core. These stellar populations are located in the thin disc and are undulating as if echoing the vibrations of an ancient and distant shock. According to numerical simulations, these specific motions could be due to the passage of the dwarf galaxy Sagittarius near the Milky Way between 300 and 900 million years ago. “This recent research calls into question the sometimes simplistic picture we had painted of stellar motions. Now, we’re looking at galactic dynamics in a completely new way,” concludes Carine Babusiaux. And there will be more surprises in store for scientists, as Gaia will soon be releasing its third data catalogue to fuel fresh discoveries.